I'm kind of on a magnet kick right now. I found a bag of 30 of these glass gems at the Dollar Tree for, yes, $1.00. My 1" paper punch cut out the perfect-sized circles to use for these. So a little bit of Mod Podge and a magnet later, I had more super cute magnets to add to the refrig. Like the other magnets I shared last week- these are really easy and inexpensive to make. 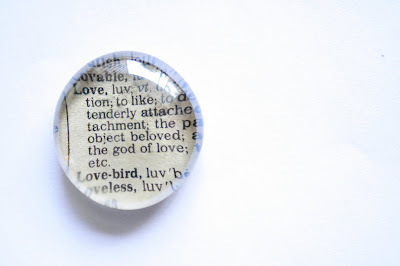 I printed out some pictures in tiny proportions, then found some words in a vintage dictionary I wanted to use (family, love, loving), as well as some vintage sheet music words and music- the glass magnifies the words- super cool. I used the 1" paper punch, but you could easily trace around the glass gems onto the paper you want to cut out and free hand cut it. 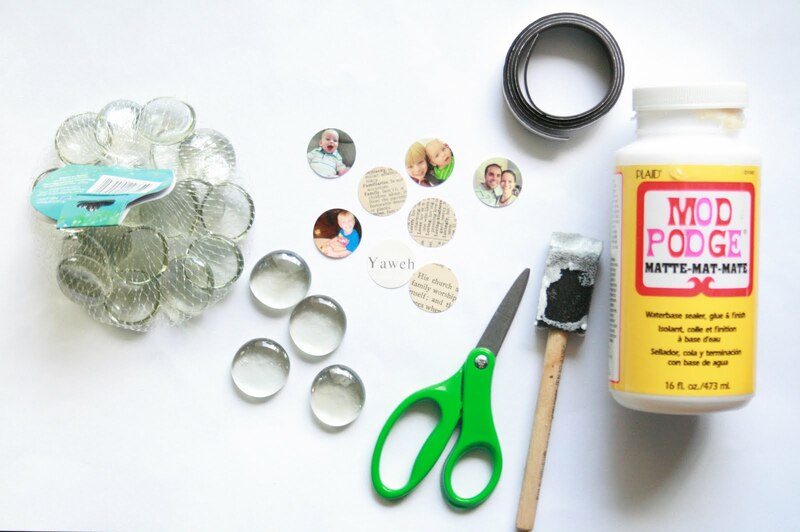 Simply brush a light coat of Mod Podge on the back of the glass gem and then adhere the picture/image. Press down and gently rub the image to get all of the air bubbles out. Let fully dry. 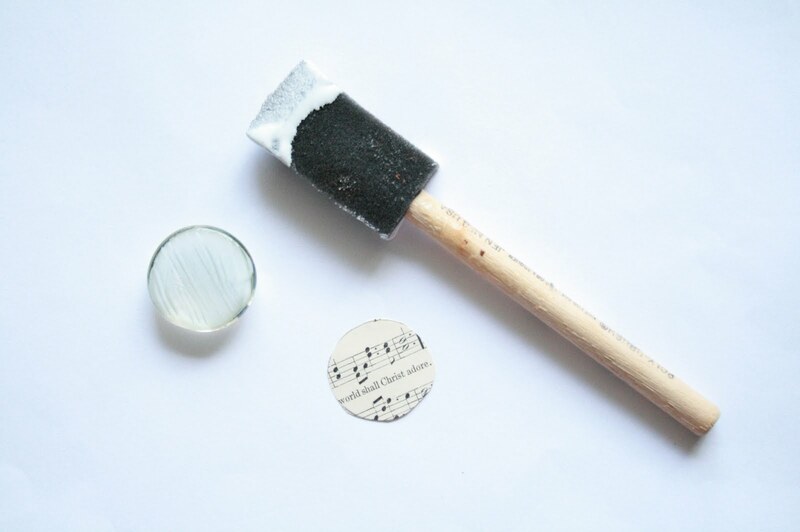 The glue will dry clear. So simple, but so very very nice! Really cute idea. Thanks for sharing! love that it's so easy to put together. 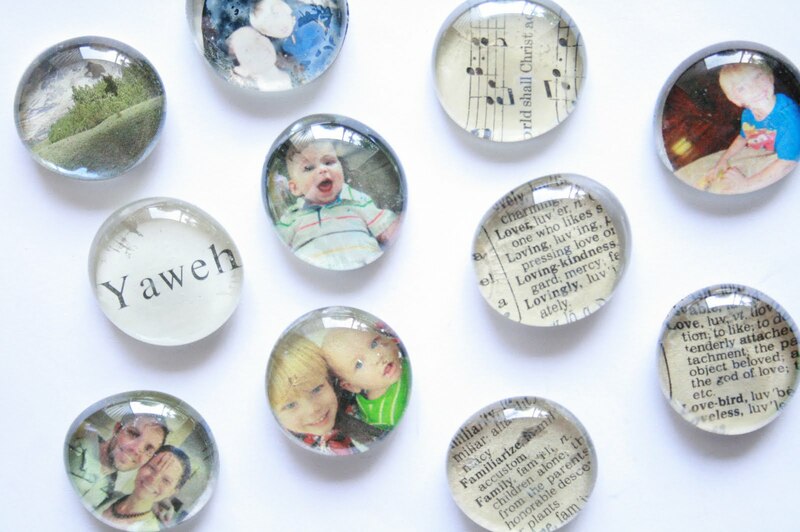 Am going to make them as gifts for my girl's pre-school graduation. These are stunning. I've always wanted to make some. Thanks so much for the idea!! A couple of questions: How did you get the photos so small? Did you use a computer program to resize the images? Also - did you use a special photo printer? this is great...love, love, love...thank you!!! 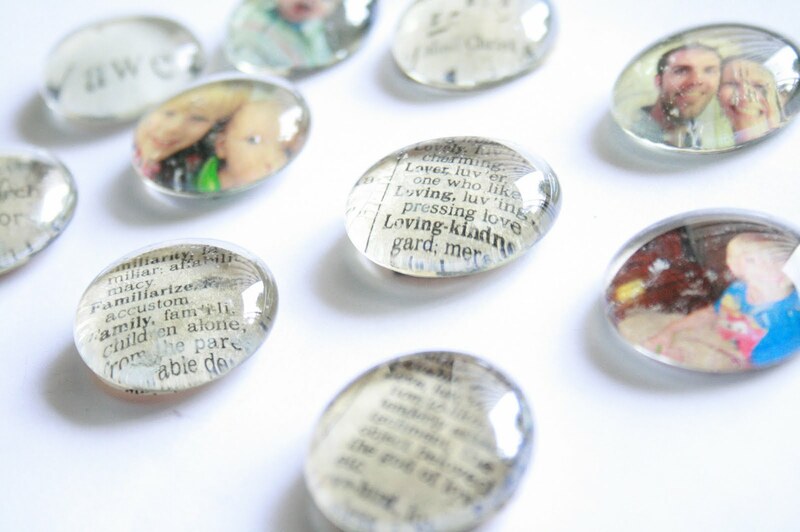 These are very cool, I've made them before and given them as gifts. 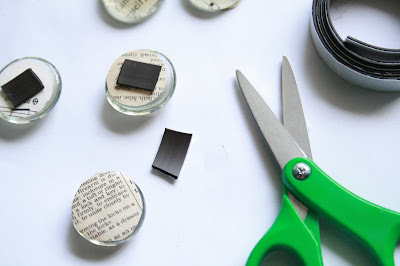 I just wanted to mention that you may want to invest in strong magnets, I found the sheet magnets on the glass gems weren't quite strong enough to hold things well. They are a great gift though and always appreciated. Going to send some with our Save the Dates for our wedding.